Home / Saturday 30th November 2013. Christmas Meeting at Exeter Racecourse. Saturday 30th November 2013. Christmas Meeting at Exeter Racecourse. The traders were Villavan crafts and Pauline’s patchwork plus quilting books a Chinese auction, so lots of goodies to please and opportunities to shop. The morning was introduced by Christine Badger, our chairman. A little housekeeping and notices, then on with the day. 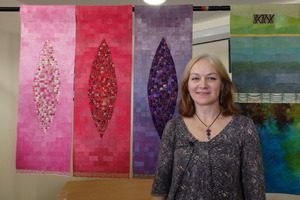 The first speaker of the morning was Katherine Chambers, with a wonderful array of Goddess themed quilts. The work was amazing made from tiny pieces of fabric all intricately machined together. Her techniques were definitely different but absolutely beautiful and made you think outside your comfort zone. The Royal British Legion brought the Poppy quilt and it was set up at the end of dining area so we could all see it before it begins its journey around the country. With it was the banner which features a world war one, soldier mounted on a horse. Lunch was of its usual high standard and the ladies who arranged it all did a marvellous job. It all ran smoothly in spite of the queue going along the corridor and down the stairs, and that was only half of us! The lady from the Royal British Legion, who is in charge of the Poppy Quilt thanked us for our efforts and seemed genuinely moved by the history behind it. We were invited to add names of any one we were connected to, who had been involved in warfare, be it now or in the past. These could then be added to the banner. Our second speaker of the day was Anya Townrow. The whole stage area was a mass of colours and beautifully pieced quilts. No snoozing with the Anya on Stage She is a veritable Fizz Bomb and her exuberance is second to none. When she talks about her techniques she makes it all sound so easy and she flourishes quilt after quilt, illustrating how talented she is. 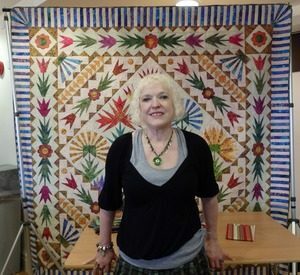 It was a wonderful day and all senses satisfied, good food, excellent speakers a veritable quilting feast and wonderfully hosted by SWQ.